Knowing where and how to run a car history check is important if you want a useful car history report. The better the report and the faster you can get it, the easier it is to make a decision on a used car you may have been eyeing to buy. In Australia, there are numerous online services offering car history checks. The good ones are never free. That’s because Revs Check, which used to be free from the Australian government is no longer an option and has been replaced by the PPSR which attracts a fee. Plus, you need more information than just the finance owing which is what the PPSR primarily provides information on. That’s where a car history check and the resulting car history report comes in handy. For a used car, you need more information than what the buyer gives you to ensure that you are making the right decision. Most persons will only need a car history report if they are planning to buy a used car. That’s because you should know as much about the history of the car before you buy it. Buying a car history report is one of the best choices you can make when buying a used car as the information provided in the report can help you make the best decision. Comparing the year, make, and model of similar cars does not give you the true value of the car you would like to buy. The history of a car can affect its value. If the car has been in an accident, or it was damaged, this affects the actual value of the vehicle. As such, you need to know these little details to ensure that you are paying a fair rate for the car. Otherwise, you may end up paying more money than the car is actually worth. A car history report will carry the PPSR details on whether the owner has any finance owing on the car. This could be that a loan was used to purchase the car by the current owner and the owner still has money left to pay. Or, he or she took out a loan and used the car as collateral. It doesn’t really matter how the encumbrance was done. What you need to know is if the car is still encumbered. Otherwise, you could end up inheriting someone else’s debt. And if that’s the case, you may end up losing the car to repossession. Once that loan is registered on the PPSR, the owner of the debt has all legal right to repossess the vehicle in lieu of repayment from the borrower. And you may end up getting the bitter end of the stick on that deal. This is an avoidable scenario once you run a car history check and get a car history report with a PPSR certificate. Trying to find a car history check free is not a good idea. You cannot rely on the website or the information that you may get. But, buying a car check history doesn’t have to be expensive. So, while you may not be able to check car accident history for free, you can do so at an affordable cost which could end up saving you thousands of dollars if you were protected from buying a lemon. There are affordable car history checks available online, including here at REVS Check Report. You can get your car history report by doing a car check history by VIN or by a car check history by rego number. Each vehicle has a unique identifier number called the Vehicle Identification Number (VIN). You can request a car history report online using just the VIN number. Simply locate the VIN number in the car or ask the seller to provide you with the number. Input the number and run your car history check. Once you get your report, you will be able to make a better assessment of the car to see if it’s worth buying or not. You can search the PPSR for the history of a car using the registration number and the state. You can run a car history check NSW, a car history check WA, or for any state in which the vehicle is registered. All you need is the registration number of the car and the state in which it was registered. Then you input the details, click “get report” and follow the rest of the instructions. A detailed car history report will then be emailed to you. 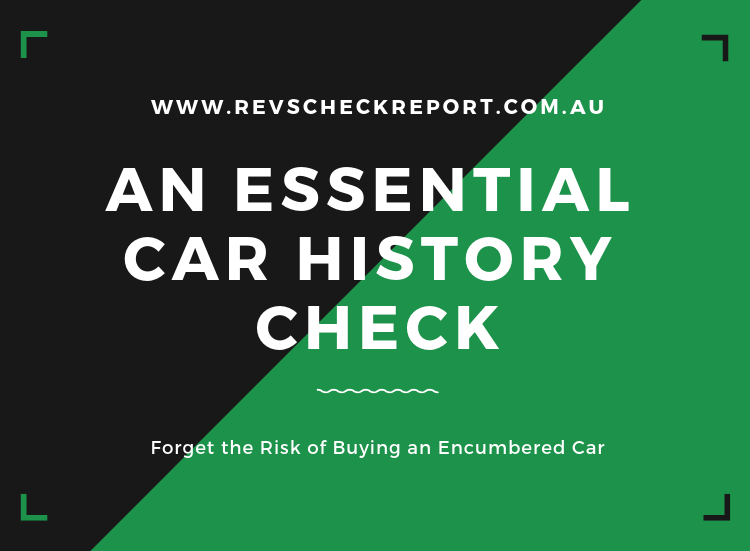 So, don’t make an expensive mistake and regret not getting a car check history in Australia. Run a car history check and get your detailed car history report so you don’t end up buying a lemon.